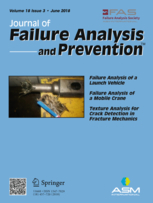 Irony machine, start your engine: A pair of engineers have lost a 2017 paper in the Journal of Failure Analysis and Prevention over a failure to determine who owned the data. The article, “Solder selection for reflowing large ceramic substrates during PCB assembly,” was written by Prashant Reddy Gangidi and Noy Souriyasak, both listed as working at a semiconductor firm called FormFactor Inc., based in Livermore, Calif.
Evidently, at least one of the authors lacked the okay to publish the data. This article has been retracted by the corresponding author as he did not have permission to publish the data. The editor has been unable to contact Noy Souriyasak regarding this retraction. The scientific content has been removed for legal reasons. The email included a notice to ASM and Springer Nature issuing a “take down” request under the DMCA (17 USC sec. 512, et. seq.) because the use of the material was not authorized by the copyright owner. We are unfortunately familiar with the DMCA, aka the Digital Millenium Copyright Act. Gangidi complied with the demand immediately, Fleming says. We attempted to get a comment from FormFactor but our emails to the company went unreturned. We couldn’t find any documents linking Noy Souriyasak with FormFactor. Fleming says the journal received a copyright agreement signed by both authors. I attempted to contact Noy Souriyasak regarding the retraction notice. I used the FormFactor email address that was provided on the original submitted manuscript, and received a system email back that it was undeliverable. The author has retracted this article, Numerical Simulation of Cracking Propagation of Asphalt Concrete Beam, https://doi.org/10.1007/s11668-017-0307-2, due to data calculation errors made during the preparation of the manuscript which render the conclusions invalid. The author agrees to this retraction.